The bulk volume water solution is an alternate density neutron method which partitions the water in the formation into the free water in the pores and the bound water in the shale. Water saturation is obtained from the ratio of free water to effective pore volume. This is another version of the Shaly Sand Models and suffers all the same problems as other shaly sand models, particularly the problem of heavy minerals. Go HERE to read the warnings and cures. 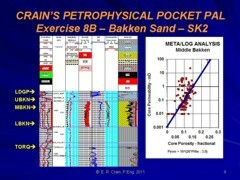 A major assumption required is the value of the apparent density log porosity of dry clay in the shale matrix (PHIDDC). This is often a negative number because the dry clay is more dense (lower porosity) than pure quartz. Calculate bulk volume of bound water in shale. Calculate total porosity, also called total bulk volume of water. The formulae are shown graphically in below. This method is mathematically similar to the shaly sand crossplot method. If matrix offset is required for heavy minerals, apply the offset to all neutron and density values including shale points first, then use the above equation. The method is also called the dual water method and is the basis of many wellsite and office computer programs. Nothing special is done in gas zones, as the values computed for PHIt and PHIe are reasonable even if gas crossover occurs. 5: PHIDDC = (DENSDC - DENSW) / (DENSMA - DENSW). 1. Assume data for Sand "D".